Please refer to our stock # 5439B when inquiring. 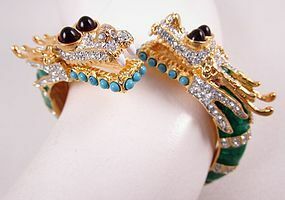 This wonderful clamper bracelet was made by the renowned costume jewelry designer, Kenneth Jay Lane. It is 1 3/8" wide at the crossover point and has an interior measurement of 6 1/2". It has a hinged back and will fit most average wrists. The dragons have bright green enamel with red cabochon eyes, and the interior is signed "KJL". There is some minor chipping on the turquoise stones, but it is not noticeable when worn.